For over 4,000 years, green tea has been a staple of Asian culture. Ancient Chinese and Japanese civilizations believed drinking the liquid could cure diseases and heal wounds. In modern times, green tea’s popularity has drastically risen in Western culture, and research is establishing the beverage’s health benefits, including weight loss, heart health, and cancer prevention. A study published in the Journal of Periodontology suggests that regular consumption of green tea can help promote healthy teeth and gums, too. Lafayette dentist Dr. Young discusses how green tea can have so many beneficial properties. 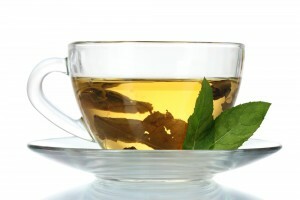 The main reason for the belief in green tea’s healing properties lies in its wealth of antioxidants, called catechins. These antioxidants act as helpful scavengers, hunting down free radicals that can damage cells and lead to illness. Other foods, like berries and dark chocolate, also contain antioxidants, as do other teas. Green tea, however, is made from withering and steaming the leaves, so its antioxidants are more concentrated than those of its fermented brethren, like black and oolong teas. Another benefit of antioxidants is their ability to help reduce inflammation. One tell-tale sign that gum disease has developed is red, swollen, and bleeding gums. This inflammation indicates that your immune system has detected harmful oral bacteria and is attempting to fight it. The Journal of Periodontology study analyzed the periodontal health of 940 men aged 49 through 59. The results showed that participants who drink green tea daily had significantly lower instances of gum disease than those who did not. Aside from drinking green tea, you can also fight gum disease by controlling bacterial buildup with twice-daily tooth brushing and flossing. Be sure to attend a dental checkup and cleaning at least once every six months to increase your chances of detecting and treating gum disease early. If you live in the 70508 area and would like to schedule an appointment with Dr. Michael Young, call our Lafayette dentist office at (337) 237-6453.